ModeKnit Yarn is in it’s 5th year, which kind of blows Kathleen and me away. And every day we learn new things. The Slippy Cowl, Our First Pattern! Kathleen is also the booth maven. It’s her world, I just hang out and tell bad jokes. When we first started it took us 4+ hours to set up our booth, and almost as long to take it down. As a side benefit, it also REALLY cuts down on our setup and breakdown time, and allows us to organize our yarn by color much easier. For a few years now we’ve displayed our yarn in long, un-twisted skeins, but now we’ve been able to cut out a great deal of grid wall and those metal arms! All of this has taken time, and we’ve had ‘bright ideas’ that were anything BUT bright when we actually implemented them. But that’s how we learn! Another learning curve was making our FLOW yarn. It’s a pretty labor-intensive product, it takes time to knit the fabric, dye the fabric, then UNKNIT the fabric into balls so the color change is visible from the top of the ball. 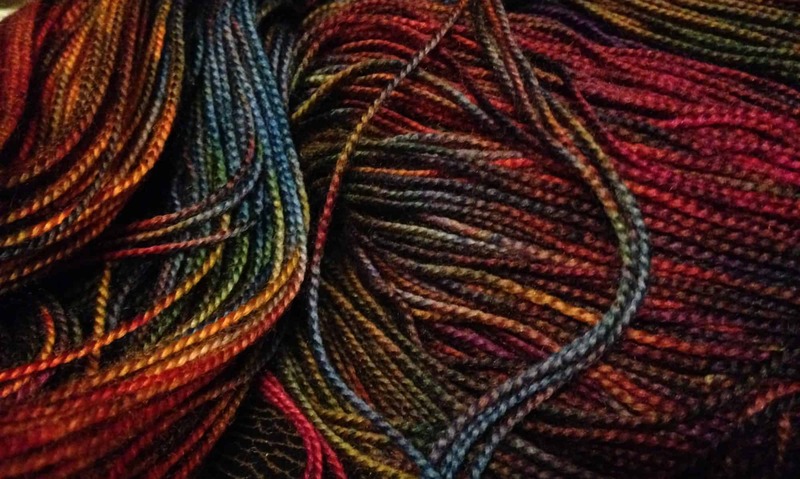 When I think of my first experiments in trying to create a slow-color change gradient yarn, I could both laugh and cry. Now we have a pretty streamlined method, and the best part is we’ve been able to teach our employees (Becca, Layla, sometimes Andy) how to create relatively consistent colorways, which has always been our goal. I’ve also become a dab hand at taking apart and cleaning our electric ball winder and swift. Because I love the glamour. We’re still growing, we’re still working on breaking that ‘more going back into the biz than in our pockets’ threshold, but we’re both very lucky that we love what we do, and love spending time together and meeting so many lovely fiber folks at the various festivals where we vend. One thing we’ve learned THIS year is that we are NOT superwomen. This Spring Kathleen seemed to go from one cold to another, with sinus infections along the way. When bronchitis reared it’s ugly head last week, we made an executive decision to opt out of one of our favorite fairs, The Kentucky Sheep & Fiber Fest, and stayed home so that BOTH of us could rest. 2018 Our NEW 5×10 Trailer! It was perhaps the best decision we made all year, and taught us what we both already knew; you can’t run on empty and expect to go very far! We hope to see you at one of the shows we WILL be able to attend, just coming up in the next weeks are The Great Lakes Fiber Show; Estes Park Wool Market; Iowa Sheep & Wool Fest and Houston Fiber Fest. So, yeah, I guess it IS good that we took this week “off”! And now, for your visual enjoyment, here’s some of what Layla and I worked up this week. !